You can now customize your retail items with extra additions. Below screenshot samples are for a Veggie Pizza topping, however same data fields can be used for any retail item and can be customized according to the customers needs. Please follow the steps to create customizable retail items. 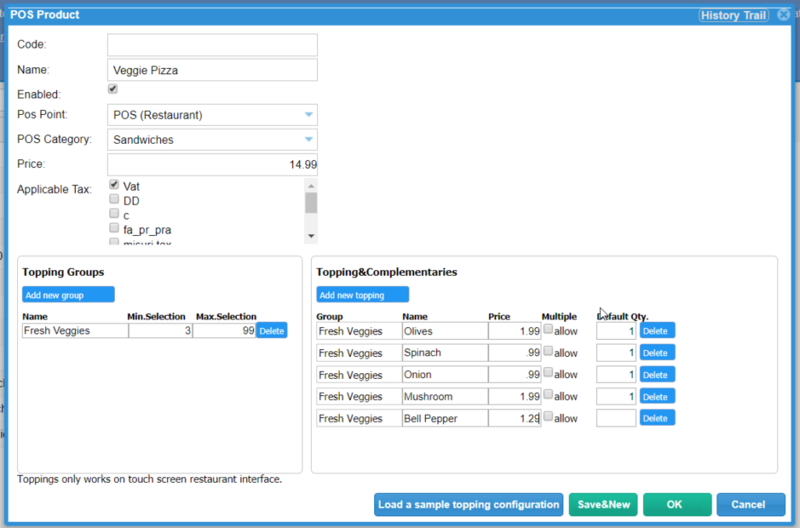 Create a new product with custom topping groups. Min.Selection box enforces user to enter a minimum number of garnishes. Toppings must be created with the sales price and a default quantity must be entered. Below screen will be displayed while taking an order. This is the window where user must add the garnishments to the order. Green Accept button at the bottom of the window finalizes this order. Final order screen shows all the extra toppings of the item ordered and the adjusted total due. Hello, Our team would like to thank you for using InnGenius PMS. This month we’re offering 100 customers a $10 gift card of their choice.The only requirement is for 2-3 minutes of your time. We ask that you write us a review on Capterra via the link below. Once your review is published, you will receive the gift card. Happy reviewing! We are making some changes in our touch POS screen. POS screen can be accessed from mobile devices in order to take guests’ order at their table. 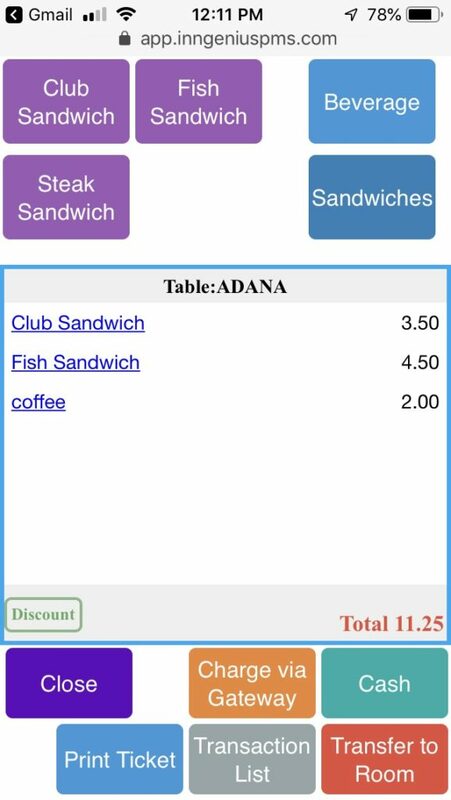 This function will eliminate the traditional ticket writing process at the restaurant guests’ table. We have upgraded our report servers. If you run into an error message please use CTRL +F5 to refresh your browser page. Please make sure you are still in the same window of the error message. Booking.com has slowed down on 10/27/2018 10Pm EST.. Please keep an eye on your reservations coming from booking.com. If you receive a booking confirmation email from booking.com and you can’t find the reservation in inngenius please manually enter them. System update completed. Please use CTRL + F5 key simultaneously to refresh your browser page to reload InnGenius. System Update is scheduled to run in less than 12 Hours. Please print out Check-in/Check-out and Night Audit lists right now in order to avoid interruptions during this update. These reports will show outstanding balances, arrivals and departures. InnGenius will be inaccessible for about one hour. For Americas 11PM EST is 10pm CST and 8pm PST. During this update InnGenius will become inaccessible, please print your check-in and check out list and night audit reports for processing your reservations manually. Update will last about 1 hour. 8/15/2018 Looks like booking.com had a small hiccup this morning. Please double check your bookings on both pms and booking.com , Thank you have a great day! In order to use this function please go to Admin—>Settings—>Payment Gateway Settings and put a check mark to enable pre-authorization. While in the payments screen simply click on Pre authorize Credit Card button to place a hold on guest’s credit card. When next window opens up you can either read the credit card details from reservation file or enter a new card detail on the right side. After filling out the information click Pre-authorize. After a successful pre authorization is made credit card window will be closed and you will be returned back to payments screen, where you can see the pre authorized amount and the time that the hold is placed on the payment card. Within that time period you can capture the whole amount, a lesser amount or take partial payments to settle the balance. You can also place additional pre authorization hold for incidentals or extra charges. Those will be listed in the same area as well. Screenshot below shows the list. Please keep in mind that at this point guest’s credit card hasn’t been charged and balance is still due. It’s hotel responsibility to setup a procedure to finalize these pre authorization holds in a timely manner. Best time of finalizing these transactions are during night audit or guest check-out. Screenshot below shows the outstanding balance with partial other types of payments taken with pre authorization hold is still in place. In this scenario when you click on Capture button to finalize the sale you will be asked to confirm the amount to capture. At this point user must compare the amount to the current outstanding balance and make adjustments as necessary. Screenshot below shows the adjustment screen to finalize the transaction. After a successful transaction, pre authorization list will show the transaction as complete. Screenshot below shows the transaction. Pre authorization list allows properties to pre authorize multiple reservations at once. Simply put a check mark on the reservations that you would like to pre authorize and click Pre-authorize button. This will place a hold on every guest’s credit card for 100% of the balance. Screenshot below shows the pre authorization hold placed using preauthorization list. Ignore the first two voided transactions. If you have any questions regarding pre authorization process please email [email protected]. 7/26/2018 EXPEDIA IS DOWN please check your reservations in Expedia and compare them to Inngenius. Some reservations may not be coming through. ALSO we have completed a room type search report on “charge by rate” report so you can now see the revenue per month by room type. 6/7/2018 Expedia is having a little bit of issues again. We will contact them and try to get more information. Please keep an eye out on your reservations in Expedia for now. As of today Booking.com is processing reservations without downtime. Please keep an eye at our news feed for possible issues to avoid overbooking. We have over 50 reservations missed with booking.com down. Please CHECK your reservations with booking.com, send a block to booking.com to avoid over-bookings. They are having a MAJOR shut down, NOT to be taken lightly. This requires IMMEDIATE attention on your behalf to monitor reservations not coming in from booking.com and/or send a block to them. Booking.com is experiencing an issue with their service today. As of 12:40 CEST reservation messages are being returned empty and also fallbacks to properties doesn’t include any information. They put up a reservation hold as of 14:26 CEST in order to prevent reservations to fall back to emails. Reservations made may be retrieved by inngenius few hours later. We continue to request reservations as usual, We will be receiving the reservations again as soon as the issue on Booking.com side is fixed. More information will follow via this news feed at a later stage once they have analyzed the full scope. In order to prevent overbookings, please use Block function to create reservations in inngenius. We are introducing a brand new affiliate program. Over the years we have received several requests for an affiliate program from our customers. We couldn’t ignore such an important request anymore. For more information on our Affiliate Program please click on Partner Program on your frontdesk screen. 2/3/2018 EXPEDIA IS SLOWING DOWN AGAIN. KEEP AN EYE ON YOUR RESERVATIONS FROM EXPEDIA, THANK YOU!! 11/22/2017 Office will be closed till Monday 11/27/2017 for Thanksgiving. Please refer to email and chat for support during holidays, thank you and have a great Thanksgiving! 10/14/2017 Expedia slowed down on 10/14 from 2am to 4 am. Just double check those on Expedia, make sure everything is great. Hope you are having an awesome weekend! -9/27/2017 Expedia has slowed down again. Everyone keep an eye out on their expedia account and make sure no reservations are missed. -9/24/2017 Looks like Expedia slowed down again. Please check your expedia account and make sure there isn’t any missed reservations. As usual, everything is working fine with booking.com. 8/29/2017 I would like to say thank you to all the hotels that have shown support, it is really great to see so many people that care and offer help. We wanted to let everyone know we are ok, we are in a hotel between Conroe and Spring. We are one of the fortunate ones, as the parking lot full of people sleeping in their cars waiting for a room to open up. All hotels are full and tons of people have been displaced. We are going to try to make it home, as our home is now not so much in danger as the rest of Houston and we are going to see if we can stay there. If we can get in, we want to be able to take a moment to calm some nerves then go out and help as a lot of our friends are trapped. We will keep you updated. 8/28/2017 We ARE STILL IN HOUSTON, Houston is under water, we can’t get out. We are stuck. We lost our house and office. PLEASE ALL HOTELS BE PATIENT as we only have limited internet and resources. Right now we are trapped between two flooded areas. Please understand that it may be awhile, maybe Friday by the time we will be able to have a place to work. Maybe longer. Please be patient as we can not do much right now. Support is just not very realistic right now especially if it is not an emergency, which our software is up and running correctly so it should not have any emergencies. If you would like to help, send us (Houston) prayers. Or water. Whatever suits you best – as Houston is out of all supplies and all stores are closed. It is not good at all. 8/8/2017 Inngenius is running security updates required by PCI-DSS compliance requirements for the next 48 hours, please bear with us during these updates as they are necessary for everybody’s safety and performance of the system. You might experience some temporary slowness off and on, you can print out date based reservation status report to help you during slow minutes. Thank you for your understanding and patience. 5/26/2016 WARNING: EXPEDIA IS DOWN, PLEASE KEEP AN EYE ON INCOMING RESERVATIONS IN EXPEDIA ONLY. THANK YOU!!! 5/23/2017 Did you know booking.com will come out and take pictures of your property for free? Pictures are the most important feature when customers are looking for a hotel to book. Booking.com is there to help you improve your hotel revenue by providing you with professional pictures to add to your portfolio. 5/14/2017 Happy Mothers day to all the wonderful mothers, mothers soon to be, and mothers of fur babies (pets) You are loved and cherished and deserve the best day ever!!! 4/26/2017 We made a new improvement that allows InnGenius to store ALL credit card information. Before, when scanning the credit card, it used to change the name. Now it will store all the correct information under credit card details. You can still add more cc info by adding add in the credit card box. 4/10/2017 Looks like Expedia slowed down again.. Please double check any reservations on Expedia that may have not come through, from yesterday till this morning. Looks like they fixed whatever issue they were having but I will keep you posted if they slow down again. 3/23/2017 NEW: Derived rates from booking.com has been established..
3/8/2017 IMPORTANT: Last night Expedia’s servers slowed down, we would like to notify all hotels connected to Expedia to cross check their reservations with Expedia and the pms and make sure there are no lost reservations. Thank you, have a great day! 2/3/2017 Forecast report has been made, please access it by going into Admin, user levels, permissions, then checking the reports to be added to your system, and always remember to hit “ok” or “save” to save all the changes, and refresh to see the changes. 2/2/2017 Increase your hotel occupancy: Set your booking engine in your innconnect to mobile devices, so customers can book their room on their phone. Make sure you have all the attractions listed on your website and or booking engine, all your neat features, and maybe even some positive reviews on your website. Respond to ALL reviews (good and bad) in a positive way. For example: If you get a bad review, respond, “thank you for your review. We are very sorry we didn’t meet all your expectations and would like to make it up to you. Our main goal is that we want all of our customers to be extremely satisfied and happy. Please contact us so we can address the situation promptly, and thank you again.” This will show customers that you care about them, and are very understanding to their needs. Even a bad review can be a good review with a response like this. Connect to channels like Booking.com and Expedia. 2/2/2017 Don’t have a logo for your guest receipt and need help? Contact [email protected], tell us your hotel name/ID number, and we will help you out! 1/26/2017- Booking.com is showing a slow response. Please keep an eye on your reservations from booking.com until they solve this matter. Thank you, have a great day. 12/19/2016 – We now have added a mandatory field for booking extra’s on your booking engine. This means, that if you want to list something separately on your room type, and have it be mandatory instead of a choice by the customer, you can do this by clicking on the mandatory field of the extra’s. This way, if you want an extra such as breakfast to be listed separately and be mandatory on the booking engine, now this can be done. This feature is in your innconnect, booking extra’s. Remember, this is only reflecting on your own booking page on your own website. Extra’s will still need to be set up separately on the channels such as booking.com. 11/28/2016 There will be a server update tonight between the hours of 1 am and 2 am central time zone, and the pms will be offline for 15-30 minutes, please print out any reservation details you may need during this outage. Please contact us on chat if you have any questions. 11/7/2016 Happy Election Day for US customers, don’t forget to vote. We added a new push feature so reservations made on your booking engine now show up instantly on your pms. Just one more thing to make your life great 🙂 Enjoy! 10/24/2016 We will be featured on tonight’s episode on Hotel Impossible as one of the donations made for one of the three hotels listed in tonight’s episode Full throttle in Sturgis 10pm (9c) on the Travel Channel. If any hotels are interested in being on Hotel Impossible and having Anthony Melchiorri come to your hotel please write to [email protected], tell us your story and why you think you need help from Anthony and we will submit your hotel. Please watch the show first, so you know what to expect. 10/18/2016 Expedia looks like they have slowed down. Please keep an eye on your Expedia account. Check the history of each reservation by clicking on the tiny white clock at the top of your reservation card. Check the history of each user by opening the user and clicking on the tiny white clock at the top right hand side. Mode of arrivals can be written down in the arrival note and has been replaced with inbound marketing. Add new guest fields have been added to the reservation card so you can enter more than one guest name in the reservation card. Referred hotel must have stayed a period of length to cover the one month of referred hotel. For example, if the hotel’s monthly payment is 100 USD a month, and refer a hotel that is 35 USD a month, the free month will be rewarded on the third paid month of referred hotel. Hotels that are referred can not fall inside of ownership, relatives, franchises or any other affiliated business. Hotel that is referring another hotel can not redeem cash prize or any other form of payment other than one free month. There must be written proof that the referral was referred by said hotel. Any discrepancies found in the rules listed here will result in loss of free month. Referring hotel owner must be presently a current customer at the time of referring the referred hotel. Referral prize must be agreed between hotels that all rules are in fact true and correct. Free month can not be applied to a different hotel that will sign up in the future but only to the existing hotel that has referred a hotel at that time for that hotel only. If rules listed have reasonable doubt and proof of being broken, the free month can be retracted at any time by an Inngenius employee. A hotel can not claim a prize for referring an existing hotel of more than 1 month. A hotel must give written notice within 30 days of referred hotel’s sign up that they have referred and referred hotel must give written notice within 30 days of sign up that they were referred to [email protected] . Hotel can not receive a free month with any other additional leeway’s such as over-extended free trials, extensions for late payments, or any other free time granted within six months. Free month can be applied after six months of any type of extensions granted. Referring hotel must have at least 3 consecutive paid months to qualify for a free month. If a hotel is referred during the first three months, the free month will be applied to the referring hotel after the third paid month, allowing their fourth month to be free as long as their fourth month does not exceed referred hotel’s monthly payments. – We have a FaceBook page https://www.facebook.com/inngeniuspms/ – please drop by and check out the latest updates. – You are now allowed to use your hotel’s email address when sending invoice emails. To do this, Click on Admin tab > Settings > “Smtp settings” button and enter your smtp details. – You can now subscribe to InnGenius from your trial account by pressing on the Admin tab > Settings > “Extend Your InnGenius Subscription” (located on the lower right) follow the onscreen instructions to subscribe easily. – We have added two new statuses to Housekeeping, these are DND (do not disturb) and Stay Over. – We now have direct connections with FlipKey, Wimdu, 9flats, HolidayLettings and VRBO. Login to your InnConnect account and press Channels to find out more. – You can now Import your existing reservations into InnGenius, to find out how, please click on Admin tab and then press Import Reservations for instructions. – We have updated the Revenue by Source Report, it now shows the Payment type (cash, Paypal, CC etc) Find it under Reports in Front Desk.